The Samsung SM-P205 tablet that is believed to be the Galaxy Tab A 2019, has been spotted on Geekbench. As usual, the Geekbench listing has been revealed information like processor, RAM and OS of the SM-P205 tablet. Rumors surrounding have claimed that it may go official in Q1 this year. 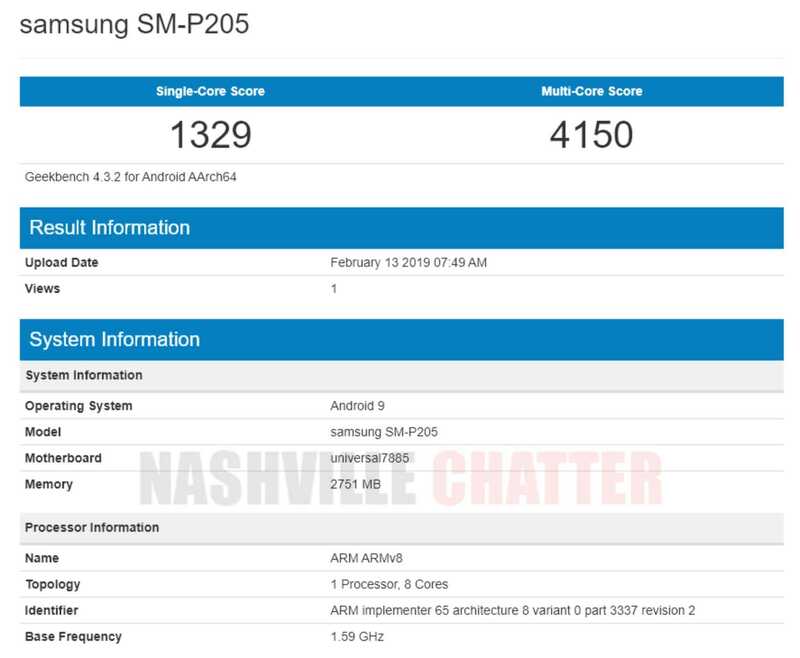 The Samsung SM-P205 Geekbench listing reveals that it has Android 9 Pie OS preinstalled. It is driven by the Exynos 7885 chipset and 3 GB of RAM. It has scored 1329 and 4150 points respectively in the single-core and multi-core tests of the benchmarking platform. The P205DXU0ARL4 firmware which belongs to the SM-P205 tablet was spotted in the previous month. Rumors surrounding it have claimed that the device could be equipped with 32 GB of internal storage and it will be releasing in colors like black and grey. Samsung tablets that came with S Pen have had the “P” letter in their model numbers. For instance, SM-P580 and SM-P585 Galaxy Tab A 10.1 variants came with S-Pen stylus. Hence, there is a possibility that the Galaxy Tab A 2019 could be arriving with an S-Pen stylus. Since the Galaxy Tab A 2019 tablet is expected to go official in Q1 this year, there is a possibility that Samsung may unleash it at the Mobile World Congress (MWC) 2019 tech exhibition later this month. The South Korean company is also rumored to be working on some other tablets. Last month, the Samsung SM-T515 tablet was spotted on Geekbench with Exynos 7885 chipset, 2 GB of RAM and Android 9 Pie OS. Also, in December 2018, the Eurasian Economic Commission (EEC) had approved SM-T250, SM-T250X, SM-T255, SM-T255X, SM-T510, SM-T510X, SM-T515, SM-T515X, SM-T720, SM-T720X, SM-T725 and SM-T725X tablet models that may debut this year.